We are delighted to be inviting our alumni back to the university for the fourth Annual Alumni Reunion. This is a fun evening for all alumni and their families to reconnect with old friends and meet new ones, while enjoying refreshments and food. The celebration is scheduled to be held at the MunHwa Buffet, Ok-dong, Nam-gu, Ulsan on February 10th, 2018. *2018 graduation candidates and newly-enrolled graduates are also welcome to join in. *Families and friends of alumni are also invited to participate at a small charge. 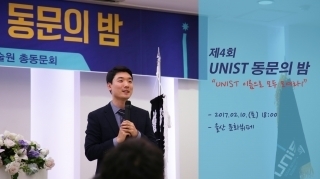 – KRW 10,000 for UNIST Alumni Association Members. – KRW 15,000 for non-members. – KRW 20,000 for on site registration.